The Ambassadors endeavor to spread the Gospel through a Spirit-directed selection of gospel songs, commentaries and personal testimonies. The main focus of each appearance is directed toward encouraging the believers and reaching lost souls for the Kingdom of God. Beginning in 1966, The Ambassadors began while the four original members were attending college in Tahlequah, Oklahoma. Over the years, there have been a few personnel changes, and today, Bill Chilcoat is the sole original member singing with the group. Bill Chilcoat sings the baritone harmony part primarily, but he has also sung bass on several of the group's recordings. Bill's love for singing gospel music began as a child while attending church. During high school, he was a member of a boy's quartet and sang at various school functions, assemblies and baccalaureates. While in college, Bill helped organize a "Chi Alpha" choir, composed of college youth at the Assembly of God Church in Tahlequah, OK. He later joined with three of his college mates to form The Ambassadors. They traveled on weekends singing at church services, revivals, camp meetings and youth rallies. Bill resides near Mounds, Oklahoma. Mike Harris has recorded vocals, bass guitar and trombone in various recording studios in Oklahoma and has served at churches in Enid, Muskogee and Bixby, Oklahoma. He thoroughly enjoys sharing the Word of God and considers the emcee portion of the service to be an important opportunity to minister. Mike owns a video production company (Mike Harris Media, LLC) and provides production services to a variety of ministries and mission projects, including television commercials and web sites. Mike resides in Broken Arrow, Oklahoma with his wife, Lori, and his youngest son, Brett. Reese Klepacz is known for his strong singing voice and words of encouragement. Singing and speaking in such places as Good Day Houston, Walt Disney World, Independence Hall, Opry Mills in Nashville Tennessee, and much more. He frequents the air waves of America through various television and radio broadcasts. Known in the gospel world as a Pastor's Pastor, Rev. Reese has become known in all denominational circuits. Methodist, Catholic, Presbyterian, Southern Baptist, Assembly of God, Pentecostal, Full Gospel, Lutheran, and others. He is currently working for Kenneth Hagin Ministries in their wholesale division and as a Sponsor Coordinator on many of their events. Reese sings the tenor part for both The Ambassadors and the Rhema Quartet. 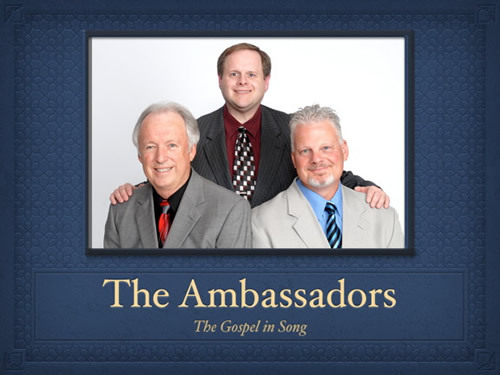 The Ambassadors traveled and ministered in churches, concerts, camp meetings and revivals throughout Oklahoma and the surrounding states for many years. Several former members of The Ambassadors have continued in the ministry as evangelists, pastors, youth ministers, missionaries, church musicians and recording engineers. This amazing group looks forward to ministering at your next event!